Yes, it's been two weeks since I wrote a blog post. We went to my mom's to dog sit and my other computer died. I have a program on THAT computer which I use to write my blog posts. So, I've just been sitting here wondering what to do because I just don't care for writing my blog posts inside of Blogger. Well, I have given up on that for the time being because all I do is keep pushing off writing and I've gotten behind. Now to catch up I'll be combining a few verses to get back on track...fingers crossed. We left off at verse 17 where the Proverbs 31 woman is energetic and a hard worker. 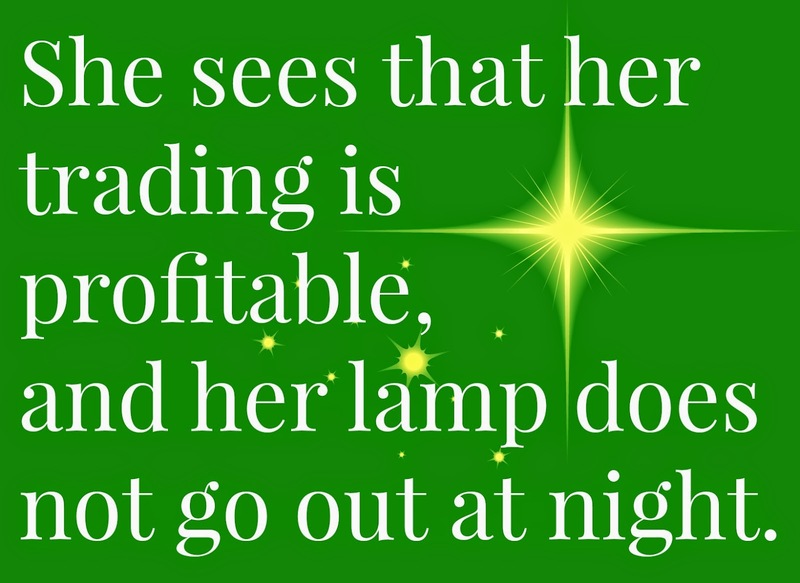 Moving on to verse 18 we learn that she's profitable and her lamp doesn't go out. For me, what I take away from this verse is that whether she's buying or selling something she makes wise choices. Let's think of this in practical terms, in how we can do that in this day and age. Do you use coupons when you go shopping? Do you call around, do research, speak to others to make sure you're making a wise decision when you make a purchase? What if you're selling something, say your car. Do you put a little extra money in it to be detailed so that it's nice and shiny for anyone who comes to see it? We each have our own strengths and ways we can make sure we're profitable in our dealings. The next part of that verse, "her lamp does not go out at night" could mean a couple of things. She could be a night owl like me! Of course, her "night owl" and my "night owl" are probably two very different things. She's probably planning her next day, making sure everything is in order. I'm usually just hanging out, finishing up work that I didn't get done through my day, and doing a bit of channel surfing. The other part could be how it relates to her faith. The light that shines bright inside of her doesn't ever go out. Can you imagine what your daily life would be like if that light NEVER went out? Doesn't it just sound so beautiful? That's definitely what I want and the woman I want to be! For our next verse, verse 19, I'm using the New Living Translation because the NIV, along with many other versions refer to the "distaff" and I was like, "what the heck is a distaff?" Turns out it's a stick or a spindle, two things I never use. What do we do with our hands? How do we keep busy? Back in the day, they were the first Susie Homemaker, I'd say. That was the work of the day. What is OUR work of the day? Whether it's being a stay at home mom/wife, a mom/wife who works from home, or a mom/wife who works outside the home, how do we keep busy? I think we should be a good example to those around us of how we keep ourselves busy. As we move on to verse 20, we see that the Proverbs 31 woman keeps and eye out for those who are in need and reaches out to them. There are so many opportunities for us to reach out to those we know and don't know who are in need. And we should keep in mind, that "needy" people aren't always needing financial assistance. Is there a new mom who could use a break for an hour or a meal made? Do you know a woman who is starting a new career and could use ideas on picking out new clothing or someone to talk to as they make the transition? Is there a mom who is struggling with one of her children? Can you share your experience with her in how you've raised your kids? Yes, there are times where we need to consider those who are actually poor. When you're out grocery shopping next time, maybe get a bag or two of groceries that are non-perishable to have on hand in case a need comes up. Have resources available if you find out someone needs assistance in ways you can't give: energy assistance, county assistance, food assistance, etc. Being able to help others help themselves is a wonderful gift. Keep your ears to the ground and aware of what's going on around you. It's a great way to find opportunities to be Christ's hands and feet to others! Inside and outside of your home, how are you being an example to others and how are you reaching out? Thanks for this study ~ many Proverbs 31 studies leave me just wanting to smack the woman, and feeling like a failure. I appreciate that you are approaching it from the "how I can transfer these traits to my own life in a way that works for me" point of view, instead of look at all the things you should be doing..... have a great 4th! OH "the Proverbs 31 woman keeps and eye out for those who are in need and reaches out to them." YIKES Since we moved, I've been so wrapped up with my little family. Thanks for that HUGE reminder!